Regular readers of the financial press know that most energy analysts often focus on two commodities: oil and natural gas. As far as investment goes, oil and natural gas are two of the biggest moneymakers in the world. But, these days, I've been taking a different approach. Mind you, I'm not saying oil and gas are bad investments (they're set up to see huge gains this year, actually), but I feel I wouldn't be doing you justice if I didn't mention the latest commodity I have my eye on. The truth is, I might be the only one with eyes on it based on what I've seen in the financial press recently. If you watch television, it powers your remote, and if you have smoke detectors in your house (I hope you do), it keeps them ready to warn you if there's a fire. You probably already realize I'm talking about batteries. But there's a crucial commodity that goes in each of these types of batteries that has dipped into very valuable territory on the open market. And while many investors and analysts, including myself, are discussing lithium — which is also used in batteries — I'm talking about a commodity that is just as important but that hasn't stuck in popular opinion, for whatever reason. That commodity is none other than cobalt. And if you haven't been paying attention to the cobalt market, you're sorely missing out on an incredible opportunity for growth and diversity in your portfolio. Cobalt is predominately used in alloys because of its strength and ability to resist corrosion, so, naturally, most of the mined cobalt is used in metallurgy for things like gas turbines and jet engines. However, cobalt has several other uses including chemical catalysts, gamma radiation, porcelain production, pigmentation for paint and glass, and, of course, batteries, which is why I like it as an investment. Like I mentioned before, cobalt is an important component of both nickel-cadmium batteries — which are commonly found in children's toys and smoke detectors, among many other things — and lithium-ion batteries. Lithium-ion batteries give cobalt its most bullish upside because they're the gold standard of rechargeable batteries throughout the world. They're used in your phone, laptop, tablet, and — if you happen to have one — Tesla Model S electric car. Most of the world's cobalt comes from the copper belt in the Democratic Republic of the Congo and Zambia, where mining is huge business. Companies dig up cobalt all over the world, as you can see above, but more than 50% of it comes out of the Democratic Republic of the Congo (DRC). Since the late 1990s, various rebel groups fought civil wars against the government, and the price spike you see in the chart between 2005 and 2009 can be attributed to what's known as the Kivu conflict. I won't bog you down with the complex geopolitical details, but it's safe to say that strife throughout the nation caused serious damage to the mining industry. The resulting supply squeeze pushed prices above $50 per pound. As the Kivu conflict ended in 2009, though, you'll see the price begin to drop along with the global recession and stay relatively close to current levels around $12.50 per pound. 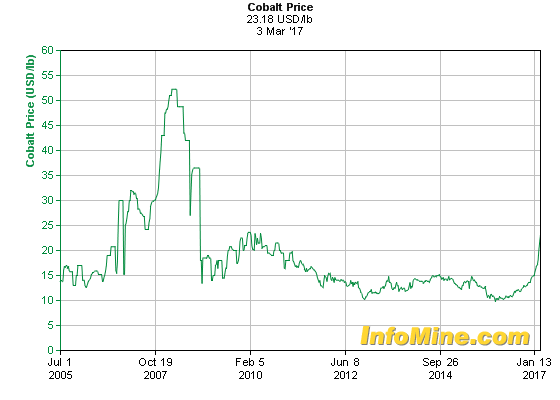 This price presents us with an opportunity to buy cobalt at what could be its lowest price for a long time. You see, early in 2015 tensions flared once again in the DRC, as countrywide protests against president Joseph Kabila broke out. The causes surrounding these protests were addressed, but there's no telling if other protests could rise and lead to more civil war and violence. But if they do, it could create another serious supply squeeze for the commodity. Of course, a potential civil war is not a reason to invest in cobalt; rather, the metal is becoming so prevalent that it only makes sense to buy now. As far as cobalt is concerned, the construction and planned capacity of Tesla's massive Gigafactory in Reno, Nevada shows a bullish future for the commodity. Tesla uses cobalt in its batteries because it provides a much better driving range, while other companies like Nissan use different, less effective metals. Once the factory starts mass-producing, it wouldn't be a surprise to see other carmakers jump on board and start using cobalt as a go-to lithium battery material. The EV market is growing fast, and the competition is nothing short of fierce. However, I wouldn't suggest an investment in Tesla at this point because the stock price is so high. Instead, I like Panasonic (OTC: PCRFY) because shares are under $11, and the company already partners with Tesla on its batteries. Not only that, but Panasonic makes lithium-ion and nickel-cadmium batteries for a wide range of other applications outside of EV's, too. As you can see, the company has been on a tear this past year! While cobalt isn't its main source of income, it did increase cobalt production by 23% in 2016. Plus, its mines aren't in the DRC, which means it will garner a higher price for its cobalt if there is a supply squeeze due to political unrest. The company's shares trade under $13, and it too is diversified with other metals and projects besides cobalt. I suggest you keep your eye on the cobalt market and these three companies in particular as lithium-ion batteries take over the rechargeable electronics market.